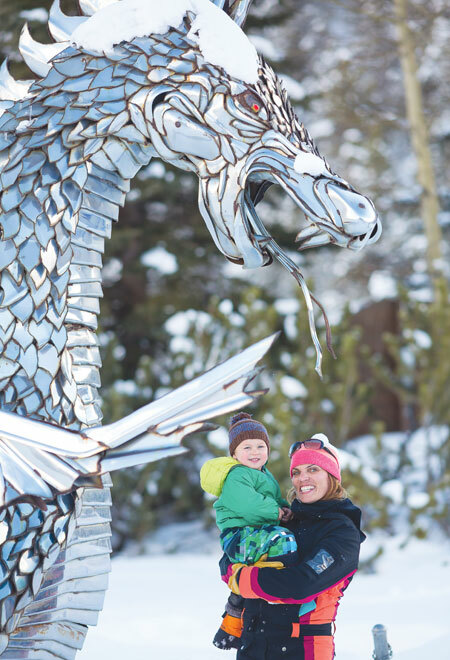 Eva Paul is known as Crested Butte’s Dragonlady, a moniker that has followed her since she first took on the Vinotok character. She muses that she’s now also called the Mother of Dragons. For a stage-shy actor who actually dislikes being on stage, Eva transforms when costumed up, taking on a fiery persona once she dons the wings and character of the scaly, multi-hued green, corseted Vinotok dragon who represents the earth. She wears it well, taking up her own challenge to participate as one of the major characters in the autumnal passion play. 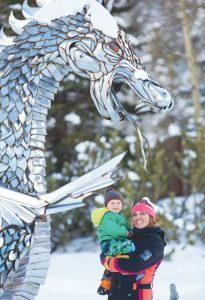 Eva sees dragon imagery everywhere, she says—some people see images in clouds, and she sees dragons in the spiky peaks of our mountains. When she was a child growing up in Bethel, Maine, known for the area’s Sunday River ski resort, Eva’s parents owned a video store and she and her three siblings watched plenty of videos. Her arts-oriented parents moved the family to a house in the woods, basically off the grid on a lake, with no electricity. She recalls that it was a beautiful turn-of-the-century Victorian that hadn’t changed much from the time it was built. “It was really magical having no electricity. Everyone else was steeped in MTV at the time. My mom made us go to the library and get books. We read and colored. My parents were crazy motivational entrepreneurs. They began with a greenhouse, growing perennials and veggies starts and then became screen printers, printing their own line of shirts and printing for others,” Eva reflects on her creative upbringing. She eventually headed back to Maine because she felt that one year in Florida was enough to know that she didn’t like the heat. She was home in Maine for a couple of years when her brother called to asked if she’d consider going with him to the Dominican Republic to work for Club Med. The idea appealed to Eva and she spent the winters of 2004 and 2005 working there. When her boss had the opportunity to work at Club Med in Crested Butte, he asked Eva if she’d like to come along. “I was a portrait photographer in the Dominican Republic. They basically paid us to stalk people on the beach and then those people would buy the photos we took of them.” This was quite lucrative, since more tourists would buy those photos than one would imagine in that era before selfies. Eva was supposed to come to Crested Butte for the winter of 2006, but Club Med pulled out of Crested Butte and the opportunity to work there was gone. In the interim of finding a career, Eva had all sorts of random odd jobs though, working for an experiential marketing company called the Gigunda Group, who would set up contractual work for clients like Olympus cameras, Discover Card and Proctor & Gamble products. “We’d do all these ridiculous things,” she laughs. Eva worked for several clients throughout her tenure with the Gigunda, such as touring the country on a big bus with the American Idols to promote Pop Tarts. She had her own portable stage where she’d hand out the toaster snack and then taught kids how to do the “Pop Tart Slide” dance. Later, she was one of the field managers for the Charmin Restrooms, a pop-up store in Times Square, Manhattan. “We built 20 bathrooms and let people experience the Charmin,” she grins. When she found Crested Butte she felt as though she had found “the end of the world, plus 30 miles,” she grins. She decided to go for a life-long career in a field she had always been interested in and signed up for classes at the Mountain Heart of Transformational Body Work in 2008. She became a certified and licensed as a massage therapist, beginning her practice in 2009. Along the way, Eva did some sewing, making hats for HJ Hats while also being a nanny. In 2014, Eva got certified to also teach massage. Expanding her association, and to include a more holistic approach to wellness, Eva became part of the Wellbeing Connection in 2011 and is now the coordinator for integrative therapies through the Gunnison Valley Hospital (GVH). “The hospital was interested in moving toward integrative therapies,” she explains. “I’m creating a foundation and a program to educate and provide services through the safe environment of the hospital. I think people are intimidated by the unknown, so they might never explore ortho-bionomy or think that massage was therapeutic. I’m hoping that with some education for the medical providers, it does becomes integrated.” With her office located in the GVH, Eva says, “The hospital’s a great support system. I love working there. I had never even been in a hospital until I had my son, Walter, in February 2016. “The Wellbeing Connection’s mission is for education and their theory is that the individual practitioners, together, will raise the whole, creating something bigger collectively,” Eva explains. “My goal is for people who have tried everything to explore alternative therapies but under their primary care supervision and referral. Right now in our practitioner services we have massage therapy, ortho-bionomy, healing touch, Reiki energy work, an eating coach, a hypnotherapist, an acupuncturist, and a light therapist. Now you can call one number to schedule an appointment inside the hospital and we have the ability to refer and communicate with medical providers. “One of my big goals for 2018 is to educate the practitioners, patients, and public, so every month, on the fourth Thursday, from 12:10 to 12:40 p.m., we’re sponsoring a quick half-hour lunchtime informative open house session. Every month will feature a different practitioner where people can learn and ask questions about their specific condition, symptoms or disease, or the practitioner’s type of therapy,” Eva says, excited about the possibilities of the new program.